If you have recently gone through multiple tooth extractions, you might experience difficulty eating or speaking. Luckily, there is a solution for patients who wish to restore their smiles after significant tooth loss. Dentures act as removable new teeth so you can eat and speak with ease. Our Grandville dentists will be able to create a set of full or partial dentures for you that is comfortable and functional. 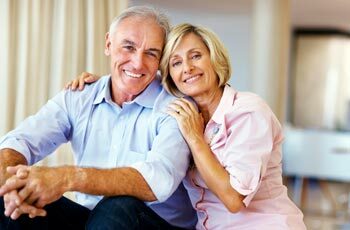 Depending on your preference, we offer both immediate dentures and conventional dentures. Like the name suggests, immediate dentures can be worn immediately after tooth removal. However, they will require some adjusting after your mouth has completely healed. Conventional dentures don’t require additional adjustments because they are made once your mouth has completely healed, which is a process that can take several months. If you’ve only had a few teeth pulled, you may want to opt for a removable partial denture. That way, you’ll be able to keep your remaining healthy natural teeth. Our restorative dentists also offer the option to undergo a surgical procedure for snap-in dentures that fit more securely than regular dentures. Sarah Palmer DDS and Amy Harmon DDS are dedicated to helping patients restore their smiles after significant tooth loss through restorative dental treatments. If you are interested in learning if you are a candidate for our denture services, call our Grandville dentist office at (616) 534-0080.